A quick little bit of handspun knitting to stave off that wonderful chill in the air. Modifications: The original pattern calls for a standard spiral-decrease crown. I really loved the allover cable pattern and didn't like how the spiral decreasing broke that up. I wrote an alternate decreasing scheme that kept the cabling intact. If you're interested in doing the same, I've listed the specifics below. Break yarn and draw through remaining sts. Weave in all ends. Knitting with handspun is a major treat, I've had such a great time doing it - I'm sure there will be a lot of handspun hats cropping up in the next few months. Next to the BSJ, they're the perfect match for all those odd 4oz skeins that have been piling up. Another one for the pile - onto the next! Beautiful! Love the pattern, love the yarn. Great job. BTW what is BSJ? Just curious. I read your blog all the time. That's gorgeous. I love the new decreases. I made that hat and didn't like it much, but with your decrease pattern perhaps I'll try it again. Great work! woweeee - beautiful handspun!!! (my colors too) I love that particular cable st., I envision one in my future. Clever decreases for the crown too. Great work. Gorgeous yarn, fantastic hat! Love your modified version. U R AWESOME - that hat rocks. Soo nice...! And thanks for the pattern alteratin, you did a great job, as always! You've outdone yourself again, Jared! Thanks for the beautiful hat pattern! Beautifully done and that color is gorgeous! Thanks for the mods. Isn't knitting with your own handspun the best! It's all you :) and once again superbly. From the top view and in the color choice it kinda looks like a brain :O) It looks great! Delurking to say it is just gorgeous. Thanks for sharing your modifications - I love working decreases in pattern. The first thing I thought when I saw the crown was "Wow! I love those decreases" and then I read it was your mod, it figures. Nice Job, it's a beautiful hat. I really like this hat -- like you, I've made a couple of Shedirs and love them, but they're very labour-intensive. 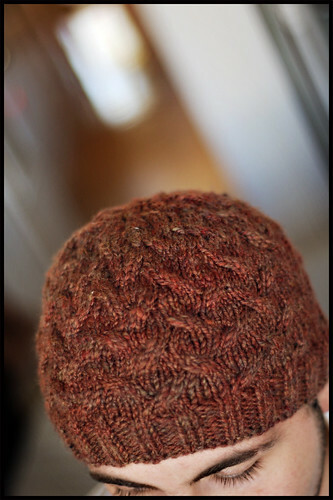 This cap has something of the same effect, texture-wise, but would knit up much more quickly. I'm putting it on my list, with your mods. Looks awesome! I need to add this pattern to my Ravelry queue. 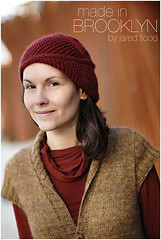 I love Marie's patterns -- and it's nice to know they look great in tweedy handspun. 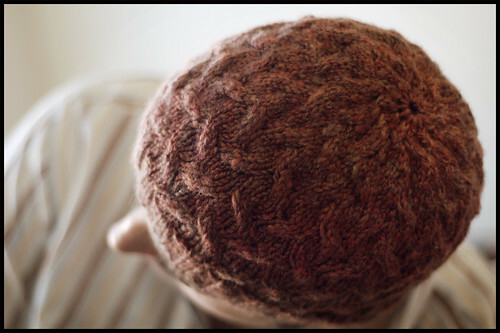 I absolutely love what you did with the crown shaping -- I will definitely be doing that when I knit this hat. Thanks for sharing your crown decrease modification. Keeping the allover pattern makes all the difference. 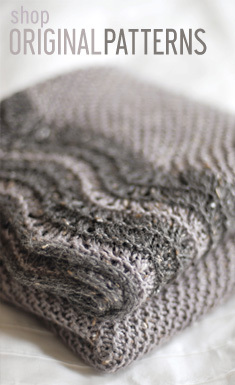 "Cabled Crown Marries Fab Handspun Tweed to Brilliant Effect!" - headline from the NY Tweed. I'll just repeat what has already been said. What a great hat! I love the yarn and the cabling and everything. How fantastic! You're in style for the winter! Your blog always has a nice surprise. Very nice. Your handspun looks fabulous. I just bought some lovely fiber in autumn shades that would be perfect, if I would spin it up. Sweet hat! Thanks for the modifications. Your handspun is so perfect, I'm just amazed. Gorgeous as ever! Love that color - it's perfect for the pattern. It's amazing how fast you've become good at spinning! The cap is cool, and I especially like the color of the handspun. Really very nice. I don't know what's more beautiful- your handspun or that pattern. Either way, the result is gorgeous! Nice hat, thanks for the pattern (changes)! Cool. I've been spinning in the past months on and off, but I've been having trouble as what I want to use the yarn for. Nice hat. All your work is beautiful. When I got done with chemo in 2005 I no longer had eyebrows or eyelashes. What I have now is kind of pathetic. I would like to have yours. When are you going to start selling your yarn?!! Huh, huh? It's really gorgeous. Love the hat. simply fabulous! I love your modifications! This hat is beautiful! Bravo. I love that you spun the yarn and knit the hat. Great allover cable pattern right to the top. Love this! The handspun is beautiful. You have the knitting Midas Touch. Beautiful. You say you used Smariek's Karma Cap pattern, but that is more of a zig-zag ribbed pattern. Your's looks more like a cable or double-cable pattern. Did you make other modification other than the decrease for the crown? It's a great hat - I like how you knit the pattern through the whole hat. Your yarn is beautiful, too! Great handspun and thanks for sharing your mods. I have been thinking of making a hat for my son. 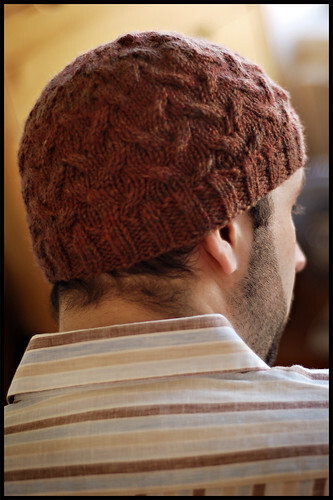 I think the Cap Karma pattern with your mods and with some left-over Rowan Yorkshire Tweed Aran in a dark brown would look great. Lovely. I'll have to see if my fella would like one. I guess I'm not alone; I can't find the hat that you're modifying on the original site. Can you provide a little more information? Thanks! I'm sure you've heard this before, but that yarn is beautiful. i love the fall(ness) of it! the hat is stunning, i'm off to join the group. i love cables! I needed a pattern to knit the hubby for upcoming 5th Anniversary and this is the one! Thanks for being such an inspiration to so many of us, everything you knit looks awesome. Gorgeous handspun, too! Thanks Jared! I just found your blog today through Ravelry. You are an amazing knitter. And an awesome photographer, too. Love the hat pattern featured here. Great color choice. I'm truly inspired. I love it. I can't wait to make one myself. My boyfriend has been begging me for a cap for months and I just haven't found any patterns I like. This one is def. the winner! oh as much as you have a penchant for all things wool i think you have a penchant for photographing noses from new angles. i adore that. Love the hat in Holiday Knits 2007! I saw the cap in Holiday Knits and thought - "I bet Brooklyn Tweed makes that!" - then I saw the designer...I love your aesthetic! hey, I'm sitting here gleefully shivering... FINALLY the temperatures have dropped below 120. Love the hat. your willingness to cable impresses me. I've lived in 11 different places in five different cities and three different countries over the past four and a bit years, so I feel your moving pain, and sympathise with you. I've just found you today (I can't think how I've missed you up until now!) and thought I would say that I have spent far too long looking at all your amazing knitting- but that I have enjoyed it greatly. Okay, I'm sorry, but I just have to say, this hat makes me cringe because it looks like a brain. I keep thinking of the Indiana Jones movie with chilled monkey brains. You are so nice to include this info! I love how the decrease turned out. Wonderful blog thanks for all info and inspiration! your homespun is really inspiring ... i've been looking at spinning wheels! What a beautiful hat to enter into the Autumnal season with. And twice as fabulous when made with your own yarn! WOW!! 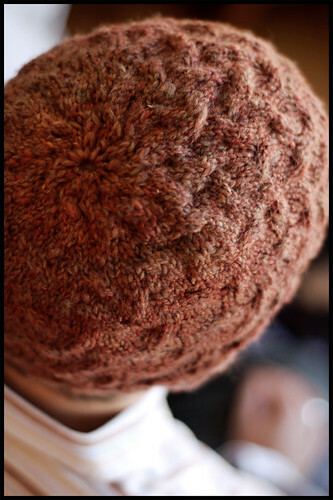 I would love to learn how to knit a hat like this!!! Love this hat and would like to make it. Somehow, I'm missing the number of stitches to cast on. I'm sure it's there in the pattern, but I can't find it. Help! Just wanted to thank you for the alternate decreases. I made the larger size hat (104? cast on, per the original pattern recommendation) for my hubby and wasn't sure it was going to work -- but I just followed the pattern and it turned out beautifully. I'm going to make your IK hat next -- that one's for me. :) Thanks again! Your emailbox is full! Do you have a pattern for the Trapper Ripoff hat? On Row 8, you've left off the beginning asterisk so it isn't clear if you begin again from the k3 or the bracket. Please clarify. I just made your Koolhaas hat out of a Miss Babs batt. It turned out great. I like this one, too. Great job on the spinning, and on reconfiguring the crown shaping! Beautiful! I love the color! I know what you mean about all the 4oz skeins piling up! Very true. I'm scheming to dye,card,spin and knit myself a whole sweater. Call me crazy! 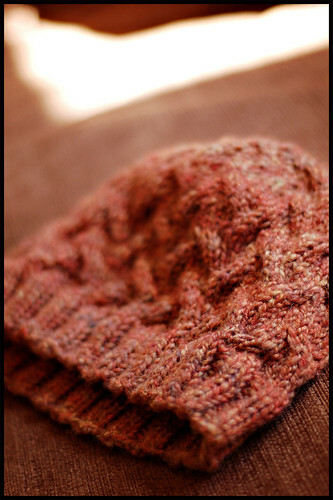 very cute hat - rustic looking with the cables in that color. Thanks for calculating the decreases in pattern. Saved me enough time to make several for Christmas gifts. Thanks also for the pictures that convinced me the FO is suitable for men. Great job! Thanks for sharing all of your work! Great work! Thanks for the lovely decreases. I cast on for the Karma hat, then realized that this is the Karma Swirly hat. Oops! Frog, redo! I read your blog as a resource, love it. olá jared.. nem precisa dizer o quanto gostaria de ter as habilidades.. aqui no Brazil as tricoteiras te amam de paixão.. gostaria que vc divulgasse mais receitas e gráficos dos seus trabalhos.. eu fico babando.. parabéns!